sweet tangy coleslaw. I love you. Yes. Yes. I know. Coleslaw? What in the world? This chick posted about potato salad yesterday and now she is posting about coleslaw. Yes I am. But hear me out. All coleslaw recipes are not created equally. Even in the great state of Louisiana, there are major differences in our coleslaw recipes. I never knew this. But ya’ll, and I am not exaggerating, I had NEVER been to Shreveport before 1994. No I am not lying. I am dead dang serious. I came up here with my mom to see BD’s mom when she was sick (back when he was just Clay, my childhood friend. Before the whole falling madly in love, marriage and 4 kiddos thing) and I remember passing a Home Depot and thinking “wow! This is not a little podunk town. They have a Home Depot!” Please keep in mind that I am from Alex. and we did not have a Home Depot at that time. Not sure where I got my notions from. I was 19 and living in BR and going to LSU and thought I was hotsy totsy. This was August and please keep in mind that by the next January, I was a Northwestern demon and that was that. So, I was a drifting college student who did not know Shreveport was a big city. Anyway, as far as I know, when you live in Central Louisiana (at least when I was young), you took field trips to one of 3 places if you got out of town. Houston (back in the day we went to Astroworld), New Orleans, or Natchitoches. So as far as I was concerned, LA stopped after Natchitoches. How ironic that I now live in Shreveport, right? And I love it here. Go figure. My whole life seems to be a lesson in irony. Or maybe I protest too much and try to run the show and God likes to show me in funny little ways that he is the boss and I will enjoy the path he chose. ( I am NOT dating some country boy in Keithville!! 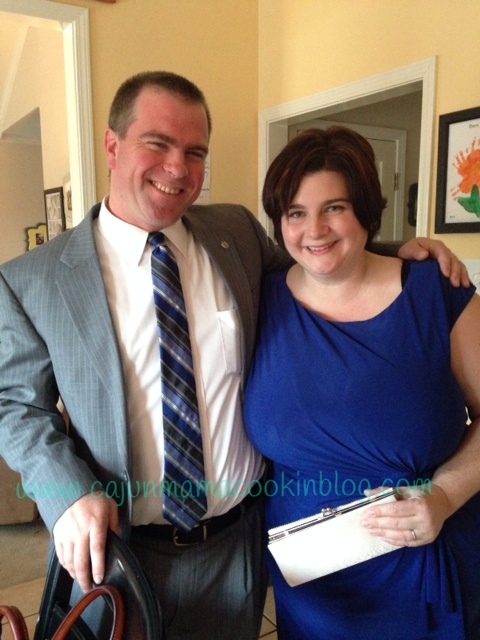 Nope, I dated him and married him. Thank heavens God knows what he is doing and has the power!) Either way. I know I am where I am supposed to be, coleslaw differences aside. Oh yeah, I am supposed to be talking about coleslaw. Blogging ADD is no joke. Excuse me when I go off on my trips down memory lane. Ok, so before I was a Shreveport gal, I only knew of one kind of coleslaw. And we never ate it with BBQ. Never. Seriously, not ever. At least not in my family. The main times I can remember eating coleslaw was with grillades and rice and gravy and maybe fried fish or at a boucherie. my cabbage is not shredded fine enough. It is a work in progress, just like my potato salad. I had a friend who is from Alex. and has roots in Avoyelles like me (Denee I am looking at you) and she asked me to post a recipe. So, I will do my best. It definitely takes me back. And I have to say, while mayo based coleslaw had its day in the sun for me…I think I prefer it this way. Just not with grillades. Please note, I will make adjustments to the recipe as I get better at making it. Straight forward, simple, uncomplicated. Perfect. Ok, cut the bottom hard part off of the cabbage. You don’t need that. Now cut the head of cabbage in half and in half again. Now, here is where I have some adjustments to make. Taking a good heavy knife, shred the cabbage very fine, into little ribbons. If I had to give a measurement, I could say a 1/4″ thin strips. Fine. But really, it is not the end of the world if it is thicker. Again, work in progress. 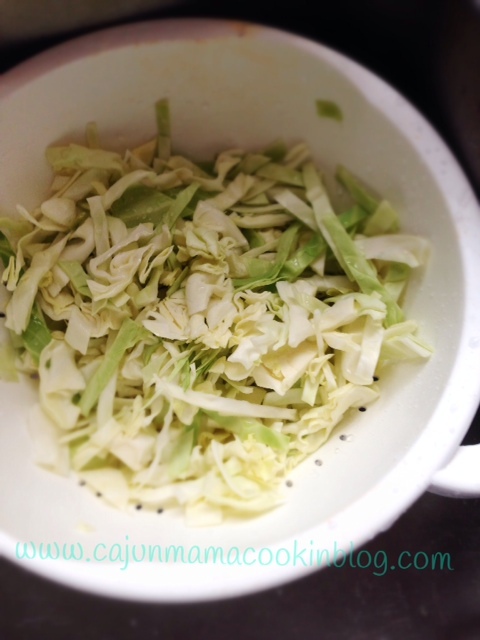 Add the cut cabbage to a colander and wash well. Let it dry or get some paper towels and soak up the excess moisture. Ok…now dump the washed cabbage into a bowl. In a separate bowl, whisk together your other ingredients. Adjust accordingly to suit your family’s taste. Pour over the cabbage and then toss the shredded cabbage with the vinegar mixture. Let it sit in the fridge for about an hour if at all possible to let the flavors soak into the cabbage. You are ready to go. Sweet, salty, crunchy, tangy…all the good stuff together. 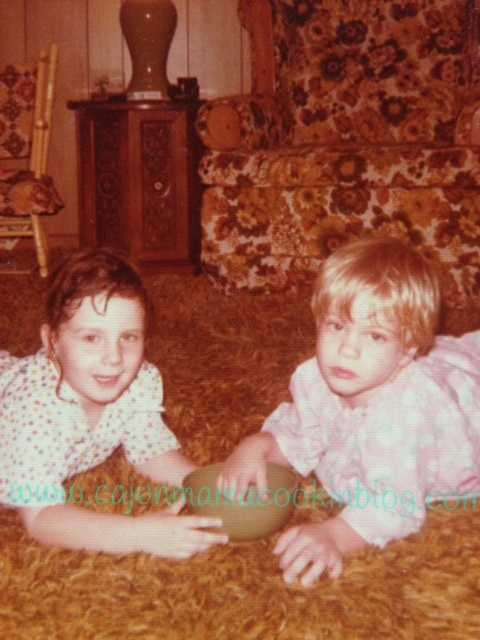 BD and I…circa 1978…he was my best friend. We ate vinegar based coleslaw and loved being together. 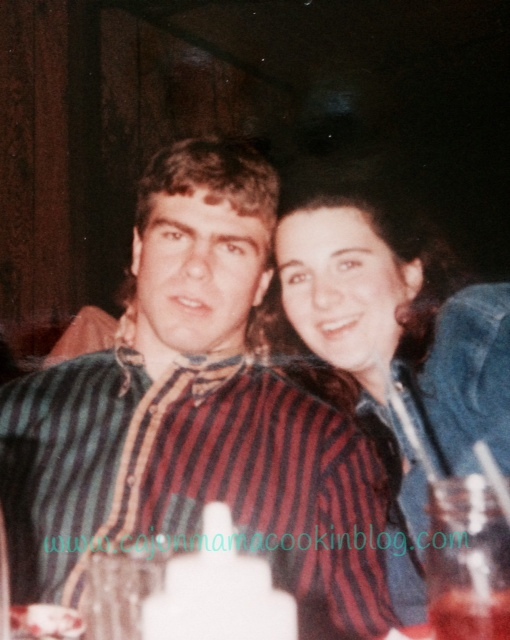 Circa 1996…finding our way…in love and coleslaw. We were evolving. 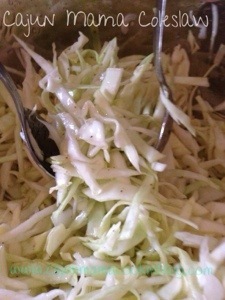 Circa a month ago…still straightforward and not fussy as this coleslaw recipe. He is still my best friend. Gotta love evolution. Yum! Love your story of evolution lol! Thanks for sharing. Also love coleslaw. All kinds. Grew up eating hand shredded with mayo based homemade dressing. Still prefer that over storebought but now I love vinegar based dressing. Will try yours next batch. 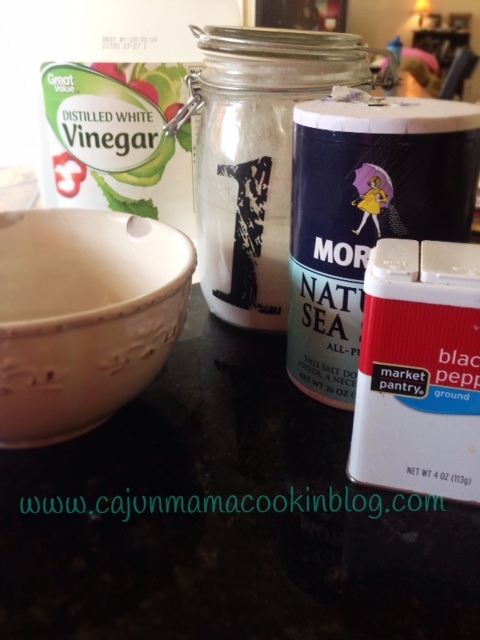 Had some at a friends last week and she used Ken’s Sweet Vidalia dressing. Also very good!